So the Mrs. asked me to pen a guest blog about irrigation. Unfortnuately (for you), I don’t have her wit, brevity, or ability to use spell check. Still, I will do my best. Drippers, misters, and emitters...oh my! First of all, there are likely to be many “code” requirements for irrigation systems of which I am unaware. Unless you have a particularly nasty homeowners association, it seems pretty unlikely that you’ll fall victim to the irrigation police. Still, it’s wise to understand if your neighborhood/city/state/region have any specific irrigation regulations of which they are particularly fond. some are for multiple (http://www.amazon.com/Orbit-62032-Yard-Watering-System/dp/B000BH7KQO/ref=pd_ts_hg_3?ie=UTF8&s=home-garden). Think about the kinds of plants you have and what their watering needs are. Some might require daily, others every 3-4 days. You’ll need a timing device for each different timing you require. 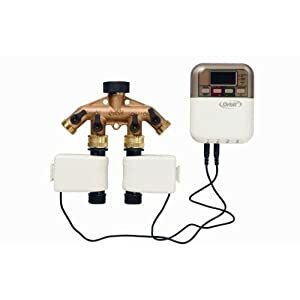 You can use Y-adapters (http://www.amazon.com/Orbit-58248-Garden-Y-Connector-Shut-Off/dp/B000YDVRH8/ref=pd_ts_hg_16?ie=UTF8&s=home-garden) either after your backflow preventer to allow you to hook up multiple timers, or you can hook up Y-adapters on the outlet of your timer to send water in different directions after the timer. You can probably identify a reasonably straight line (or a few lines) that will get pretty close to most of your plants. The plan is to run a reasonably large “backbone” or “header” on this line, and then tap that line to get water to your plants. If you have more than one timing device, make sure you get the right backbone to the right plants. I use mostly 1/2 inch tubing (http://www.amazon.com/Irrigation-Premium-Grade-Polyethylene-Tubing/dp/B0035M3KCK/ref=pd_sbs_ol_1), for which many fittings are available: T (http://www.amazon.com/Drip-Irrigation-Barbed-Poly-Tubing/dp/B0035LS97C/ref=pd_ts_hg_24?ie=UTF8&s=home-garden), elbow (http://www.amazon.com/Drip-Irrigation-Barbed-Elbow-Tubing/dp/B0035LTL5G/ref=pd_sim_ol_9), cap (http://www.amazon.com/1-2-Compression-End-Cap/dp/B0035XFWD4/ref=pd_ts_hg_23?ie=UTF8&s=home-garden), and brackets (can’t find a link...they’re available with all these other parts, trust me). An adapter is available to attach 1/2 inch tubing to standard garden hose (3/4 inch female pipe thread, http://www.homedepot.com/h_d1/N-5yc1vZ1xgc/R-100141505/h_d2/ProductDisplay?langId=-1&storeId=10051&catalogId=10053). Oh, there’s a tool that cuts 1/2 inch pipe really well (http://www.amazon.com/Rain-Bird-Landscape-Dripline-TC-1PK/dp/B000FK01A4/ref=sr_1_fkmr2_2?ie=UTF8&qid=1279767676&sr=1-2-fkmr2), but you can probably find a different way. Go nuts! To get the water to the actual plants, I use 1/4-inch tubing. 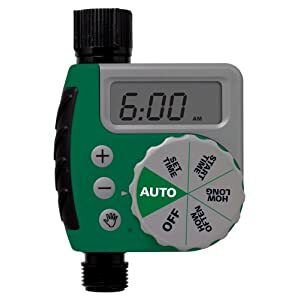 I use this tool (http://www.amazon.com/Rain-Bird-Landscape-Dripline-Watering/dp/B000FJX5PI/ref=sr_1_2?ie=UTF8&s=home-garden&qid=1279595764&sr=1-2) to tap into the “backbone” close to the plan. 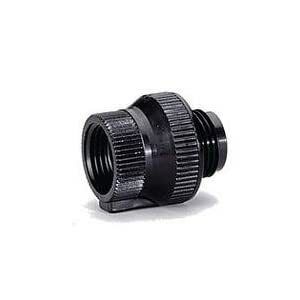 I attach one of these fittings (http://www.amazon.com/Raindrip-312050B-50PK1-Barb-Connector/dp/B002JLG3DQ/ref=sr_1_6?ie=UTF8&s=home-garden&qid=1279767188&sr=1-6) to an end of the tubing and poke the fitting into the hole I tapped. I then cut the tubing to length with side cutters (http://www.amazon.com/Economy-Side-Flush-Cut-Pliers/dp/B001MOYU8Q/ref=sr_1_3?ie=UTF8&s=home-garden&qid=1279767600&sr=1-3) and attach a dripper (http://www.amazon.com/s/ref=nb_sb_noss?url=search-alias%3Dgarden&field-keywords=drip+irrigation+button+drippers+gph&x=0&y=0&ih=20_14_1_0_0_0_0_0_0_1.32_90&fsc=-1) or a mister (http://www.homedepot.com/h_d1/N-5yc1vZ1xgc/R-100143134/h_d2/ProductDisplay?langId=-1&storeId=10051&catalogId=10053). Oh, I keep it all reasonably neat with brackets (http://www.homedepot.com/Plumbing-Irrigation-Irrigation-Accessories/h_d1/N-5yc1vZ1xgcZbqli/R-100146056/h_d2/ProductDisplay?langId=-1&storeId=10051&catalogId=10053). You’ll want to monitor closely for the first few days and weeks to make sure that your system is properly balanced. I use a moisture sensor to see how all the plants are doing...probably best to check just before the next irrigation cycle is due. Seems like the plants should be on the dry side of the scale but not dusty or anything. If all your plants are soggy, you might want to reduce the time on the timer. If they’re all droopy, you might want to add some time to all. If some are looking good while others are dry, you’ll want to use a larger dripper or mister on that specific plant. You can also use 1/2 inch T’s (http://www.amazon.com/Barbed-Tee-Pack-50/dp/B00263C0RU/ref=pd_sim_ol_12) and put a separate dripper or mister in, if needed. Turn on each timer manually for a few minutes and make sure that all the drippers/misters are working properly. For extra credit, you can install one of these http://www.homedepot.com/h_d1/N-5yc1vZ1xgc/R-100157124/h_d2/ProductDisplay?langId=-1&storeId=10051&catalogId=10053 to fertilize your plants periodically. I’m sure you can figure it out. I hope this helps. It’s a little bit of an investment up front in time and money, but really pays off with the ability to have lots of lovely plants that you know won’t be dead in two weeks! ** zentMRS here - Did you enjoy The Mr's info? He's wicked smart. He'd be happy to answer any questions you might have. About irrigation or other stuff. (He didn't say that exactly, but I figure he will if you ask...) In the meantime, check out An Oregon Cottage for her weekly Garden Party. The Mr is a good job! I bet your back yard is quite green now! well done, mr. and wow. that's the high-tech-est garden i've seen in a long while! That is a really helpful post--thank you! So my question is: What if you rotate your garden beds each year, so different plants are grown in different spots? How easy is it to adapt an irrigation system to a garden that gets moved around each year? Or is this simply a better solution for permanent plantings? As someone who hand waters just about everything in the yard and garden I can appreciate this post. It has been on my to do list for a few years now... I just can't seem to motivate myself. Perhaps this is just what I needed! How did the critter guard work on your bird feeder? Thanks for visiting myeverydaygraces... the onion jam was delish, can't wait to make more! It is perfect for an antipasto plate. Wow a guest blogger and an irrigation system. Fancy stuff! :) I just wanted to personally invite you to my "Canning Week Blog Party" August 23-27th. I've seen your Rosmary Jelly and hope you will link up to our party. We will also have guest blogers with tips, recipes and of course recipes. Can't wait!!!! Awesome guest appearance! Nice job on the irrigation system! I already spend a good hour every couple of days in the main gardens and want to actually sit to enjoy the patio. This post really helps me understand how I can plan it out for when I do get planters designed and attempt to build them (I see big, long, elevated planting beds - somehow…). Thanks for all the directions! Awesomely detailed post - I directed "my guy" to read it immediately!